The Town of Babylon is home to an 18 hole, par 3 golf course located between Cedar Beach and Overlook Beach on Ocean Parkway. The relaxed nature of the course is perfect for beginners, as well as seasoned pros looking to practice their short game. The course is open daily (weather permitting) from May through November and is available for golf outings. Rentals for golf clubs and balls are also available. 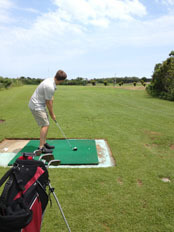 The Town also offers youth and adult golf lessons during the summer. Check out the Recreation Guide for more information. The Cedar Beach Golf Course also serves as one of Long Island's only disc golf courses. The fees are the same as the golf course and disc golfers are allow to play multiple rounds. Those interested in playing disc golf must indicate so at the guard booth for parking consideration. Those playing disc golf must follow all golf course rules and etiquette. Disc golfers must tee from the gray or black brick tees located near the golf tee mats, not the golf mats themselves.